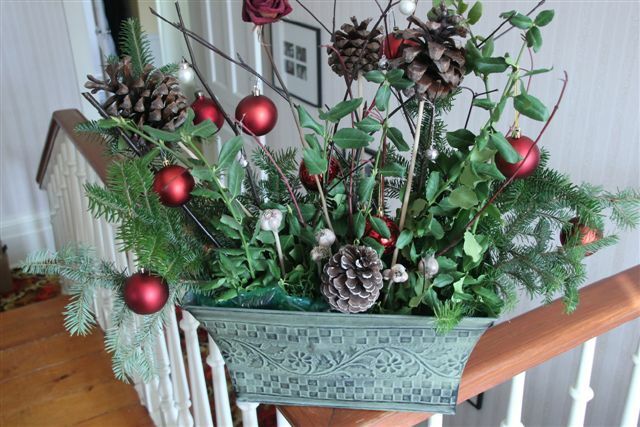 How hard could it be to make your own Christmas arrangement? Looks easy enough in the magazines, and on the internet, right? It’s almost Christmas and I’m surrounded by women who cook and bake AND do great home decor. My sister, daughters, mother-in-law, sister-in-law, girlfriends: domestic goddesses, every one. Some even sew and knit. I, meanwhile, am a failed domestic diva. I baked a cake – once. I failed knitting – twice. I try – Lord knows I try – but I’m still an exceptionally underachieving cook. But it’s Christmastime, after all. A time of great hope. 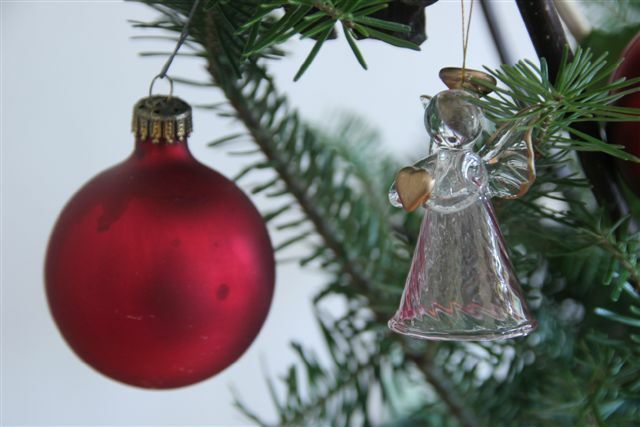 In the past, I used branches from the trees in my garden, tied together with a big red ribbon – and called it a Christmas bough. Hanging on the front door, it was only seen from a distance, or when we had visitors. Very polite visitors. But this year, I decided to go big or …. no, I was already home, so let’s forget the rest of that saying. I decided to be ambitious. 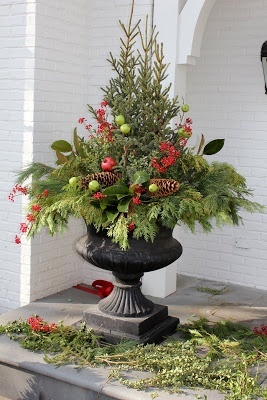 To arrange greenery in containers. One in the plant-stand outdoors, one in a container indoors. Artfully composed, of course. Did I mention that I failed BOTH art and photography in school? Something to do with composition. I collected branches of everything that grew right next to the verandah of our home. I’m under a kind of house arrest, you see – mandated by my doctor because I overdid it with the book-related activities and also started a new medication with woozy side-effects. I figured that as long as I went no farther than the verandah, it would still qualify as “resting at home”. I put a double layer of plastic in the bottom of the containers, and placed the wet florist foam on it. (The foam was wet, not the florist.) Then I stuck branches of stuff into it. Spruce. Juniper. Euonymus. Boxwood. And pine cones on sticks. I stepped back to admire my handiwork. It needed something. Aha! More red dogwood sticks. It still needed something. But I was worn out and achy and very woozy. I wisely took to my bed. Two days later, I felt brighter. Contrast, I thought! I need contrast! So I fetched some “brownery” –– brown-leaved branches from last Christmas, forgotten in a tall container in one corner of the verandah. But when I cleverly tried to add them, the florist foam had frozen hard due to cold weather and the brownery crumbled, leaves falling from brittle stems. 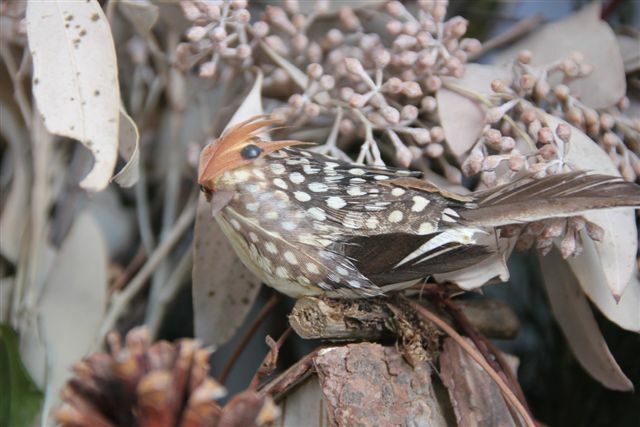 I searched the house and found a little fake bird and some loose pine cones and judiciously placed them among the greenery. But it still needed something. I just never figured out what. As for the inside container? There was a coup de grace: garlic. 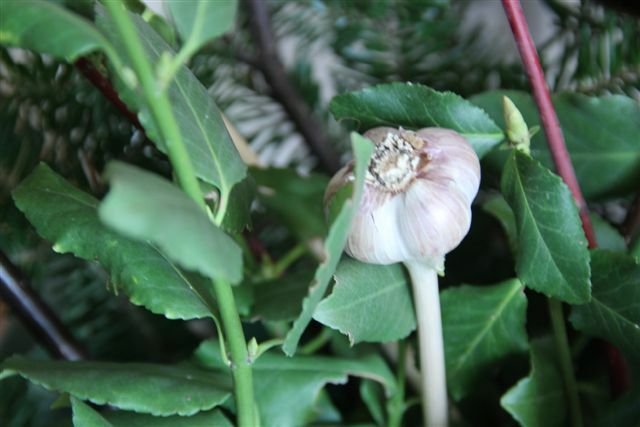 Yes, garlic on stems. Harvested from our garden this fall, it’s surprisingly decorative, will deter vampires and spice up my cooking efforts after Christmas. But that bit of creativity wore me out completely. So I stuck some shiny red Christmas ornaments on branches in the container and called it a day. Lord, give me strength. Clearly, you withheld the talent. This post is dedicated to everyone who struggles with domestic arts. And to all domestic goddesses: you give me something to aspire to. Or maybe that’s ‘perspire’. What if you can’t make ornaments,you can write books and very interesting articles,most of us can;t do. We were all given different gifts – don’t worry,be happy!!!!! Cynthia, Your indoor arrangement looks lovely. Just when I thought, a little red would do the trick, then wallah-you did it! Much better than I could have done. If it makes you feel better, I failed in Art classes as well. Cheers! Are you saying the answer to failed greenery and brownery is ‘reddery’? In the middle of yet another day of trying to break all previous productivity records, I stopped to read this installment of your blog Cynthia and laughed myself silly. Thank you. I can say ditto to all of the artsy challenges and “failures” you describe but do you know what…your gift with words is both priceless and sufficient. New saying: If you can’t….share the stories of your efforts and lighten the day for those of us who are similarly challenged and taking ourselves way to seriously. Love you! We may as well laugh, eh? Thank God for another woman who can’t do this stuff! My younger daughter told me yesterday that my attempts to decorate the hallway and staircase this Christmas “look like Christmas threw up in our house”. Then she went through, removing and replacing stuff. Do you think we’re lacking a certain gene, you and I? You think you aren’t very good at this sort of thing? All I can say is, that’s a fine job. It looks great! I stuck some dry hydrangea in the indoors one and it looks better too! We’re under an ice storm here. Like Narnia during the Ice Age, it would be beautiful, if it weren’t so scary. Fallen branches all over the place. Trees turned into giant ice sculptures. How’s the weather where you are? Je suis sûre que tu te sous estimes et que sommeille en toi une artiste…. 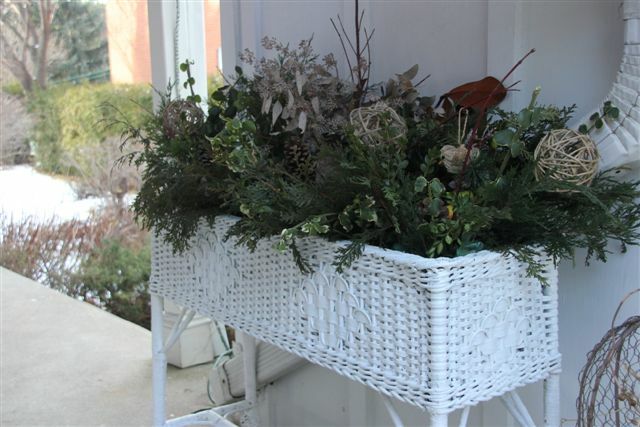 I think your basket is charming and infinitely more successful than my efforts last year – I tried to make greenery-plus-bauble hangings to go over each of the indoor doors. Luckily there are NO photos of my efforts (I have kind relatives). LOL!!! Very nice and funny post! And I think your arrangement turned out very nice! 🙂 Thank you for sharing with us your funny antics at making it. I like the one in the first shot. It looks very Christmas-y! Failed Art? 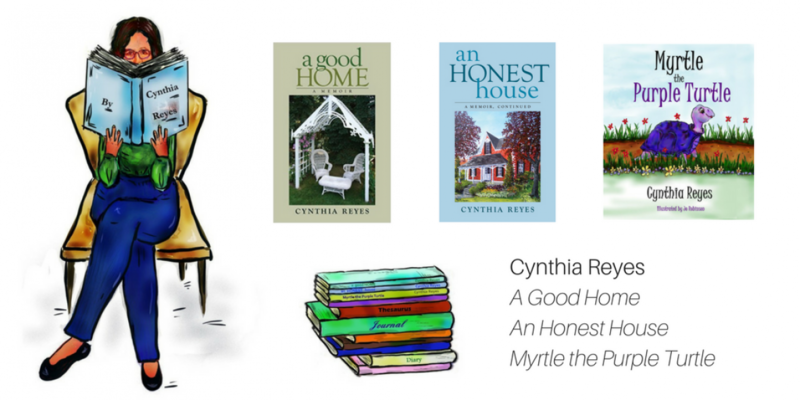 Your garden, house, and writing are evidence to the contrary! Well, if I had been fishing for compliments, I couldn’t catch a better one! Thank you, Beth. I keep trying. This is a very funny post! 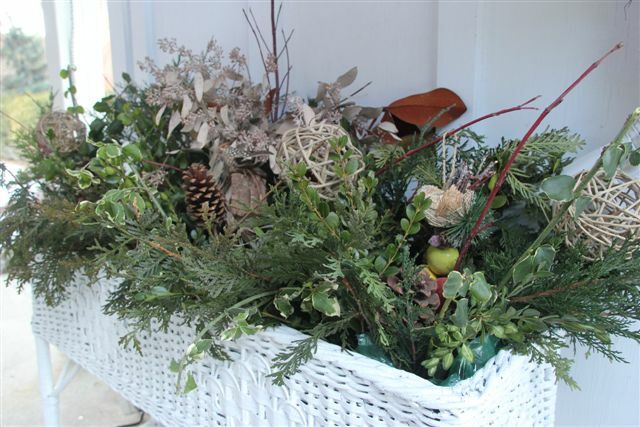 However, you managed to produce a really nice Christmassy arrangement and did it when you were feeling so ill too! I think you deserve a medal! Oh, poor you! But you have the confidence to let us laugh about your struggles–that’s certainly a good sign! I think those women got an extra gene that flew straight past people like you and me. I think your arrangement looks just fine. Not everything we do has to look like it was meant for a magazine. The world needs more reality. 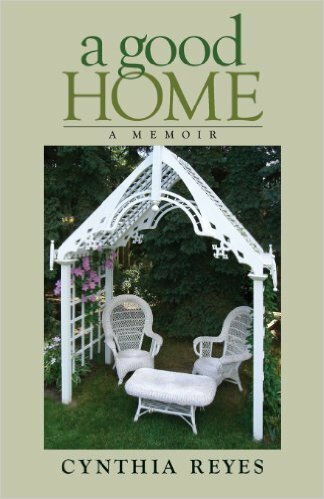 I look forward to reading more of your stories, you have a great gift for making us want to read more. “The world needs more reality”. Lucinda, thank you for those immortal words. I shall remember that when my domestic efforts turn out strangely! So good to meet another undomestic diva, Jo. Happy visiting with your daughter. Those are beautiful and I, like you, have not a crafty bone in my body! I try, I mean I really try, but I have “man” hands and my fingers can’t seem to make anything delicate, dainty or decorative!!!! 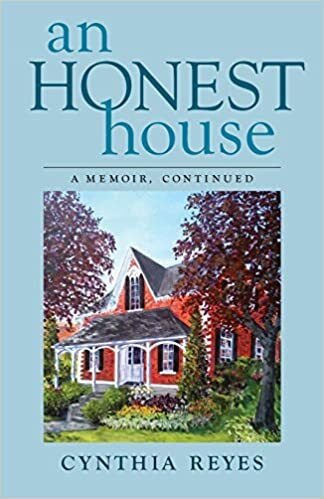 An Honest House was the recipient of the 2016 Diamond Book Award, "Book of the Year"
Cynthia Reyes featured on CBC Radio's The Next Chapter, interview with Shelagh Rogers about "A Good Home"
Cynthia Reyes featured on Metro Morning, interview with Matt Galloway about "Myrtle the Purple Turtle"
Use the hashtag #loveyourshell and share with the world what makes you YOU!